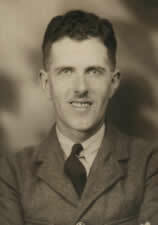 Andrew Douglas Speed, younger son of David and Elizabeth Speed, was born in Kinglessie, Fife on 24th June 1906. The family moved to Edinburgh where Andy worked as a Gents’ Outfitter for Hope Brothers, Princes Street. In 1932 he married Mary Chapman. They lived at 6 Hermand Crescent, Edinburgh. The decorations awarded, and sent to his wife, were 1939-45 Star, Pacific Star, Defence Medal and War Medal 1939-45. He died at the age of 36 and his name is on the WW2 memorial of St Michael’s Church. 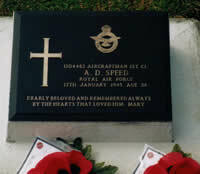 Below is a photograph of his grave in Labuan Cemetery, West Borneo (F.D.3 Labuan War Cemetery). Originally the graves were each marked by a wooden cross. This was replaced later, with an inscription chosen by the family. His name is on the WW2 memorial of St Michael’s Church. Below is a photo of his grave with poppies placed by his daughter and son-in-law, on a visit arranged by the Royal British Legion.